The first 3 months of 2019 have been busy for bonds. There are growing fears that the global economy is slowing down. Bonds have proved to be a good hedge during virtually every stock decline. But outliers may occur, notably when rising inflation has triggered a stock decline. Jeff explains that bonds appear to be back to playing their traditional role as diversifiers against stock downturns. But a look back in history reveals that inflation may be key to how well this relationship holds up in the future. The first 3 months of 2019 have been busy for bonds. Global interest rates have declined significantly, the Federal Reserve has implied that it will halt short-term rate hikes and the yield curve inverted. Overall, there are growing fears that the global economy is slowing down. These market movements highlight a critical theme for investors in 2019: Bonds are once again playing their traditional role of offsetting equity risk in investor portfolios. In contrast to this year's trend, the negative returns of both stocks and bonds throughout most of 2018 presented a critical challenge to investors. Bonds, instead of offsetting equity losses, actually started to contribute to the losses. 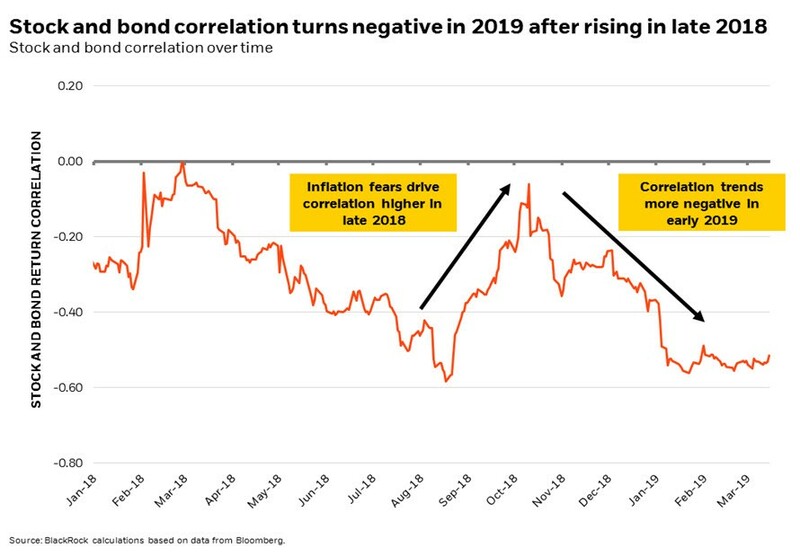 While bonds were modestly up to end 2018, there was a real possibility that both stocks and bonds would end down for the year. This is exceptionally rare. To put that into perspective, that has only occurred three times since 1929. The first time was in 1931, during Britain's currency crisis that eventually resulted in its abandoning the gold standard. The second time was in 1941, when the U.S. entered World War II. Both of these years coincided with exceptionally rare events that resulted in exceptionally rare investment outcomes. 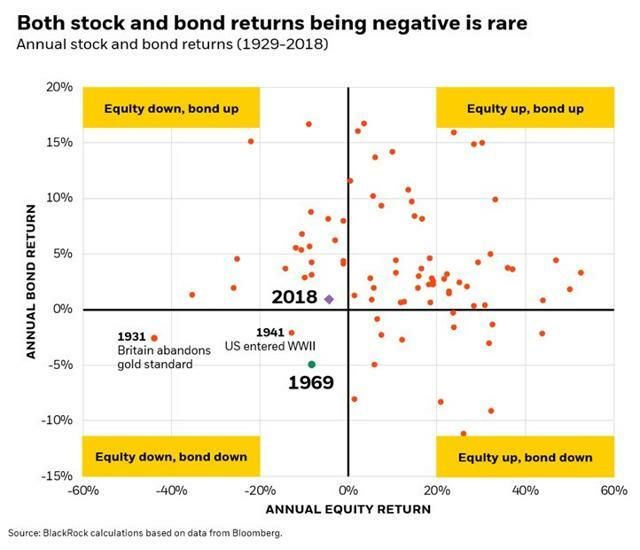 The most recent occurrence of negative stock and bond returns, in 1969, has some lessons that may be useful for today. 1969 demonstrates the risk of an economy "overheating" and the threat of a recession that typically follows. The 1960s began with low inflation. But by mid-1966, inflation hit 2%, and subsequently rose to just under 5% by the end of the decade. The Fed's response was to raise short-term interest rates. That pushed the economy into recession and drove down stock returns - but along the way, it also pushed bond yields higher and bond returns lower. What's the key takeaway for investors? Bonds have proved to be a good hedge during virtually every stock decline. But outliers may occur, notably when rising inflation has triggered a stock decline. In that case, bonds may be a less successful hedge. At the beginning of last October, Fed Chair Jerome Powell's description of policy rates as "far from neutral" suggested multiple future increases in rates in order to curtail the possibility of future inflation. But the expectation of rising rates - and the resulting falling bond prices - undermined the ability and willingness of investors to hold bonds to offset risks in their stock portfolios. As a result, during Q4 2018, stock and bond return correlation increased as returns to both declined. In 2019: A lack of inflation underwrote the "Powell Pivot"
In January, the Fed's pivot towards dovishness and pausing on future rate increases changed that outlook. A lack of inflation was cited as the rationale. As expectations for future Fed increases fell, investors were freed up to reallocate to bonds as a portfolio hedge, allowing them to revert back to their traditional role as portfolio diversifiers. Looking forward, the lack of broad-based inflation represents a key dynamic for bonds. We expect broad-based inflation to remain in check in 2019. But the outlook for wage inflation remains less clear, as signs of acceleration have appeared in some economic measures. Overall, we view the Fed as on hold and willing to tolerate the rise in wage inflation as long as broad-based inflation remains benign. However, as the lessons of 2018 - and 1969 - point out, inflation expectations are an important data point to watch, even for traditional portfolios that are diversified across stocks and bonds.